Buddy once told me I had an amazing grasp of the obvious. I'll prove it to you. Yesterday I was cleaning my No4 Mk2 sniper clone. I then proceeded to clean my #5. I had never really noticed it before but I was blown away by the weight difference! I'm pretty sure I know which one I'd like to lug across Europe and in the jungles!! I really miss my No 5. 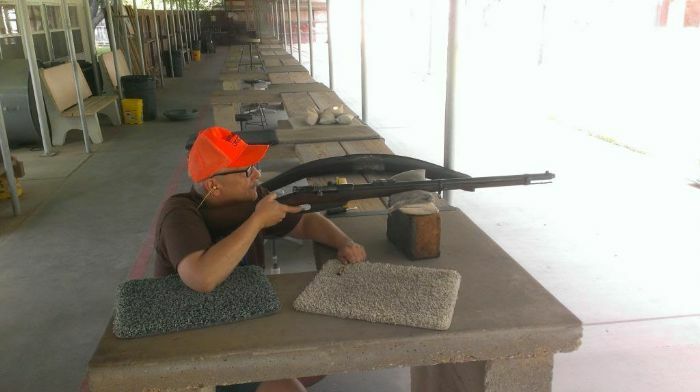 My first time realizing the weight difference was the first time I fired it. I was used to my SMLE's so was surprised by the increased recoil. When I build a rifle for some reason it usually ends up at 11 1/2~ 12 Lbs. I don't aim for that weight, just build what I think i need, but it seems to be some kind of magic point, for me at least. Most of my rifles are full patch military Surplus types & so the 11~12Lbs seems "natural" to me. Then I found the No5! I was afraid I was going to break something it felt so light at first. No 5's are a great thing..if only I could hit something with it!! ooh nice. Methinks you scored well, as I haven't seen these rifles come down in price any...or rise in availability. If the Enfield rifle is in good condition and not hacked to bits,I'll pay the 500+ bucks for it. Everytime I've seen a Jungle Carbine,it's missing pieces and they want 750.00,a lung ,and a kidney for it. You did well on that price. The No 5 does run high. Heck, when I bought mine about 7 years ago I paid $450 for it and it had issues. So, well done! I actually shot one of mine today using 180 SP Remington core-lokt iron sights. Put 10 rounds through it and all 10 hit the target at about 75 or so yards. That rifle is very accurate but even better is the performance is repeatable shot after shot. Two wall-hangers with an assistant wall-hanger, and so long as I have access to a half decent No.4 they will never be promoted!